For the last few years, during annual Ann Arbor Art Fairs, I’ve enjoyed my personal SCAMPER scavenger hunt. It usually takes me a few hours, but I locate examples of interesting art that represent each of the SCAMPER verbs. SCAMPER, of course, is an acronym that can help spur creative thinking by asking key questions about an item or task, with each focusing on the words in the SCAMPER acronym. Can something be Substituted for all or part of the item? Can two thing be Combined to make something new or better? Can something be Adapted for a new purpose or used in a new way? Can the item be Modified, Magnified, or Minified? Could the item be Put to other uses? Could the item, or some part of the item be Eliminated? Yesterday I realized I could do a SCAMPER hunt much more quickly—in this case, in the marker aisle of an office supply store. I didn’t even have to leave the Sharpies section! (And no, Sharpies is not sponsoring this blog. I should be so lucky!) 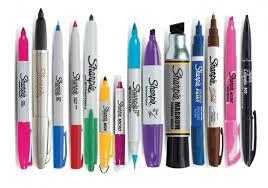 Clearly, folks who make Sharpies use flexible thinking in coming up with new products—perhaps they even use SCAMPER. Look what I found. Substitute: All manner of inks have been substituted for the traditional permanent Sharpie ink. There are water-based markers, gel markers, oil-based markers, and even glitter markers. Combine: Of cou rse you can buy various combination packs of markers, but some products combine things in new ways. For example, you can create personalized Sharpies combining a marker with your name, logo, or other message. Adapt: Every get tired of losing pen or marker caps? One type of marker has been adapted to have a retractable point. That would also be useful for people who have trouble gripping and might struggle to remove marker caps. Modify, Magnify, Minify: This one was easy. There are lots of mini markers, king-sized markers, and markers with an extra-large ink supply. Put to Other Uses: There is a calligraphic marker intended for (not surprisingly) calligraphy, and Stain it markers for writing on fabrics. If you visit the Sharpies website you can find challenges representing any manner of unexpected uses for various markers. How about some custom Sharpie sho es? Eliminate: The was my husband’s favorite. Right next to the Sharpies we found an erasable highlighter. Can’t remember if it was the same brand, but wouldn’t it be useful to be able to erase highlighter errors? Reverse: This one might be my favorite. I think of it as a reversal as it is not intended to actually write, but to test paper on which something is written—in this case on a dollar bill. You can buy a marker designed to identify counterfeit bills. Amazing. I’ll admit, to limit my SCAMPER list to just Sharpies (and to avoid driving my husband nuts in the office supply store) I did visit their website . But it occurred to me that a “One Aisle SCAMPER Challenge” could be fun, either for families or end-of-school fun. The challenge is to choose an aisle in any store and find items in just that aisle representing as many of the SCAMPER verbs as possible. Imagine a one-aisle challenge in a hardware store, a grocery store, a craft store, or, of course, an office supply store. Why not give it a try? Pick a store, pick an aisle, and see what you can find. You might even try a family competition to see who can find SCAMPER quickest, or the most original items. Or, if you don’t want the chaos of a real-store search, try a catalog comparison. Whatever you do, raising your awareness of flexible thinking in the world around you is a great way to encourage creativity. If you try, I’d love to hear what you find!